Document control. Gcode editing. OEE calculation. 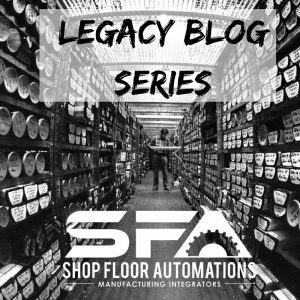 Documentation of any variety is important to us at Shop Floor Automations, and not just for our customers. We welcome you back to our Legacy Blog series, where we archive past press coverage. We appeared in the October 2017 issue of MFG News, with a piece reviewing the top three benefits to machine monitoring appearing from us. Updates to DataXchange and an overview of Touch HMI features were also in the issue. We were also in the August 2017 issue of MFG News. The benefits of cloud-based machine monitoring are reviewed in this piece from us, published in Modern Machine Shop this past January, plus we were mentioned in this piece on R&D Manco. Speaking of Modern Machine Shop, we were also in the February issue with an ad and an article. We have photos of our appearances in this issue on Instagram, too, so be sure to network with us and the #instamachinist movement! Finally, in the January 2018 Production Machining Magazine issue, we were part of the annual product directory. You can find us under Software>CAD/CAM, Software>ERP & Other Shop Management, Software>Data Collection Devices, and the general directory. For more information, we would love to start a conversation with you for your productivity needs. Call (877) 611-5825 or fill out a contact form so we can get back to you on your time.